Railway Brake Blocks by Hindustan Composites Limited. 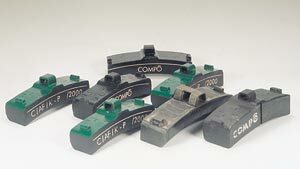 Compo C/BB/K brake block is a rigid moulded friction material, grey-black in colour, having a random fibre asbestos base and containing metallic particles. It is manufactured only in the form of brake blocks, integrally moulded to a back plate. This material was originally developed to have the ability to withstand the heavy braking demands of Electric Multiple Unit (EMU) stock, operating suburban passenger services. Its use has since been extended to a range of duties from low speed shunting locomotives to high speed passenger trains. C/BB/K has a higher and more stable coefficient of friction than the conventional cast iron block which it replaces, resulting in lower application forces and permitting the use of smaller cylinders. It is a conformable block designed to eliminate thermal cracking of tyres, which had hitherto been a barrier to the widespread use of composition blocks. C/BB/K Block has several fold advantages in life over cast iron blocks and thus significantly lengthens service periods. It is particularly beneficial in those situations where hot cast iron dust would present a safety hazard. Spark-free blocks are essential in oil refineries, chemical works and ordinance factories. The composition block has much to offer in the braking of passenger rail, minimising braking shocks by its smoother action and permitting higher load/tare factor. Indian Railways have been successfully using composition brake blocks for EMU rakes for over three decades, even in monsoon conditions. This material is particularly suitable for use against steel railway wheel tyres and for design purposes, friction level, µ is taken as 0.35. Hindustan Composites should be consulted with regard to dimensions and design of the shape or size of the block, which is being considered.